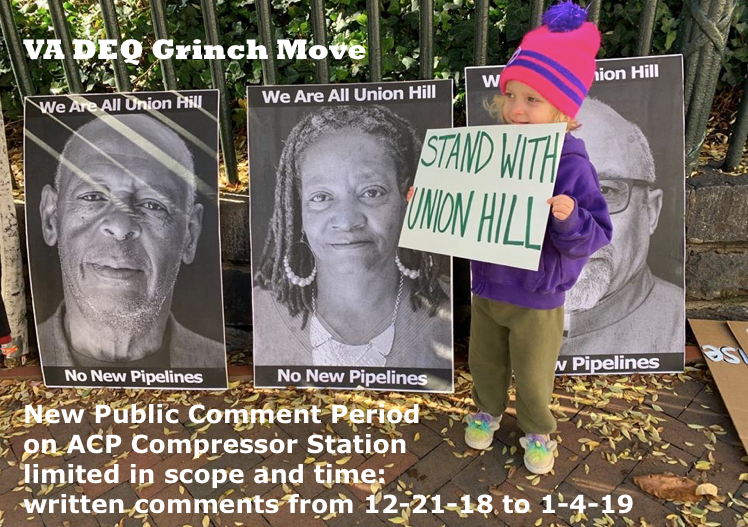 At their meeting on December 19, 2018, the Air Pollution Control Board delayed their vote on the air permit for the proposed ACP compressor station in Union Hill, asking for a public comment period to address the newly submitted or updated information submitted by both supporters and opponents. What is Governor Northam’s and Department of Environmental Quality’s idea of an open and fair comment period? Two weeks over the holidays, two weeks which include four weekend days and four further days when the state government offices will be closed for holidays. You’d think they really don’t want people to comment! “DEQ’s decision to schedule this comment period over Christmas and New Year’s is nothing more than an attempt to silence the vast majority of Virginians who will now be unable to participate. Buckingham County communities, including Union Hill, have already been through the ringer as this compressor station threatens their community, homes and health, and this extremely brief comment period adds further tension to an already stressful situation. We must ask who the short window for public involvement serves and the only conclusion is Dominion Energy and DEQ Director David Paylor, both of whom have shown they want this permit shoved through as quickly as possible. …. DEQ has shown that its leaders don’t really want the public to play its proper role in the regulatory process. DEQ can move very quickly when that haste benefits pipeline companies but action is painfully slow when the wider public interest is at stake. We assume the Air Board members intended the public comment period to be sufficient to gather well-considered and well-supported comments – not to have a comment period designed to make it as difficult as possible for the public. DEQ must extend the period to at least 30 days, a bare minimum for a reasonable process. Fairness demands it. What should you do? Send your comments, regardless of the attempt to minimize the comment period! Instructions and links to the documents included in this comment period are on DEQ’s Web site for the Buckingham air permit process, https://www.deq.virginia.gov/Programs/Air/BuckinghamCompressorStationAirPermit.aspx. The documents are also available at the Buckingham Public Library (1140 Main Street, Dillwyn, Virginia 23936), but the library, like the state offices, is closed December 24-25 and December 31-January 1. The documents to be considered per the Board’s instructions relate to questions and concerns on demographics and site suitability for the proposed air compressor station. The Board also clarified that the permit conditions, including the amendments that were discussed and approved at the December 19, 2018, meeting, are not subject to public comment. Further, the Board indicated that public comment is not being sought on the conduct of a health assessment by the Virginia Department of Health. Public comment period: The public comment period on the documents will begin on December 21, 2018 and close on January 4, 2019. All comments must be in writing and be received by DEQ before 11:59 p.m. on January 4, 2019. Receipt confirmation will not be provided for comments received during the comment period. Submittals must include the names, mailing addresses and telephone numbers of the commenter, and of all persons represented by the commenter. This entry was posted in Air Quality, Compressor Stations, DEQ, Take Action, Virginia government on December 22, 2018 by Ellen Bouton. After you ring in the New Year, we’ve got some celebrating to do together. We’ve had some recent victories in our fight against the Atlantic Coast Pipeline – so join us on the 5th of January! Bring a dish to share. Include a label so folks know what it is. Live Music by The Findells. Known for their passionate, energetic live shows … including a mix of original songs and diverse covers that encourage dancing & fun. The Fins have carved out their own sound and created a unique and lasting legend in the Shenandoah Valley & beyond, so bring those dancing shoes. Check out their latest video from the Bare Winter Trees record. You’ll be able to renew your membership to Friends of Nelson for 2019. We value your support – both time & money. We’ve said it before … we’ll say it again .. the Atlantic Coast Pipeline is not a done deal. This entry was posted in Events, Friends of Nelson, Take Action on December 22, 2018 by Ellen Bouton. Call or Write Your Senators! The Fourth Circuit Court of Appeals has vacated a federal approval for the Atlantic Coast Pipeline to cross the Monongahela National Forest, George Washington National Forest, and Appalachian Trail. Having been thwarted by the court in efforts to bend the National Forest and the National Parks Services to its will, Dominion is trying circumvent the court ruling by sneaking a last-minute amendment into a pending appropriations bill for the Department of Interior that would permit the Atlantic Coast Pipeline to cross the Appalachian Trail and Blue Ridge Parkway near Wintergreen and Reed’s Gap. Although we understand that (at this moment) the amendment has been pulled, we should assume that Dominion is pulling out all the stops to get something from Congress to sidestep the court’s ruling. Write or call (or better yet, do both!) your Senators and tell them that you are upset about any possible legislative “slight of hand,” that you oppose any last minute amendments to the budget reconciliation bill, especially one that would allow gas pipelines to cross our national forests and the Appalachian Trail, and that you oppose Dominion’s efforts to make an end run around the clear and carefully considered ruling of the Fourth Circuit Court. This entry was posted in Appalachian Trail, Certificates of Approval, Dominion, Forest Service, Take Action on December 18, 2018 by Ellen Bouton. 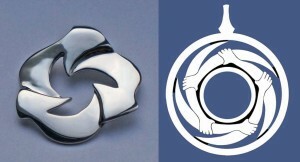 Circle of Protection INDOORS on Sunday December 16, 2018. The folks of Union Hill have voted to have this Sunday’s Circle of Protection at Union Grove Baptist Church vigil INSIDE THE CHURCH. Join the interfaith vigil with story and song, and church potluck to follow. 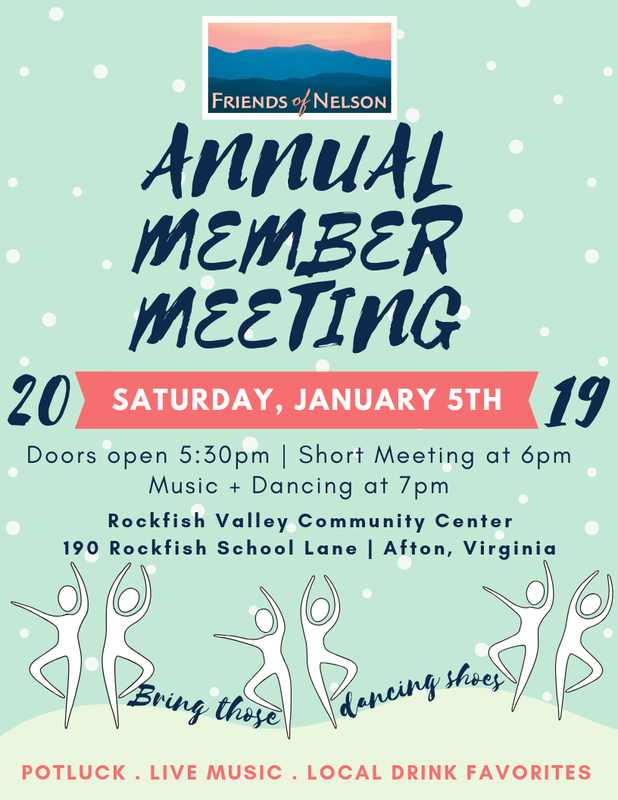 Note new location at Union Grove Church, 2522 Shelton Store Rd, Buckingham, VA 23921 (very near Union Hill Baptist where previous gatherings have been) and remember to print out those directions in advance of setting out (cell service spotty!). With music from Evelyn Dent and Farm Use Old Time String Band, prayer from John Laury and Pastor Paul Wilson, poetry from Ella Rose and personal story by Kay Ferguson. This will be the last Circle of Protection for the season. This entry was posted in Air Quality, Compressor Stations, Environmental Justice, Events, Take Action on December 13, 2018 by Ellen Bouton. 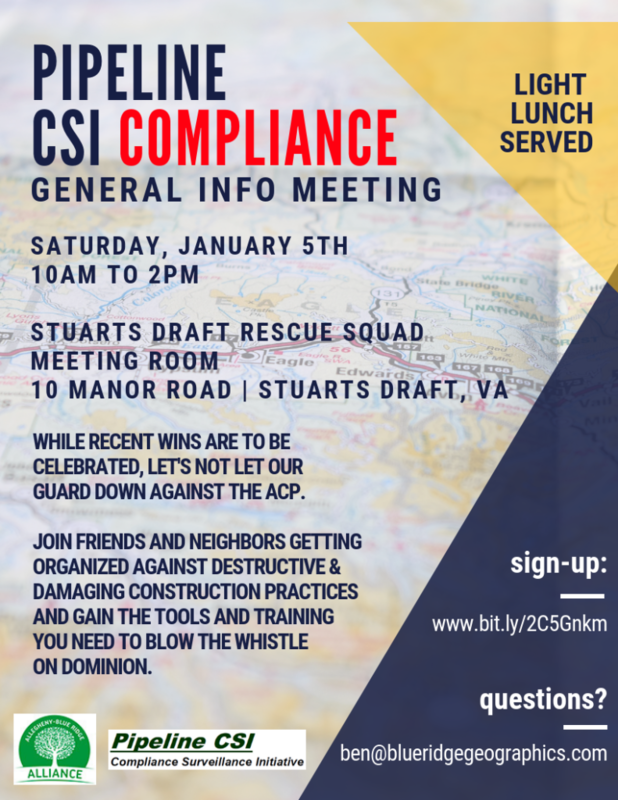 The first general information workshop in Augusta County on the pipeline Compliance Surveillance Initiative (CSI) will be held on Saturday, January 5th, 10am-2pm, at the Stuarts Draft Rescue Squad, 10 Manor Rd., Stuarts Draft VA. While recent wins are to be celebrated, let’s not let our guard down against ACP. Join friends and neighbors getting organized against destructive and damaging construction practices and gain the tools and training you need to blow the whistle on Dominion. The event is free, but CSI will be providing a light lunch and the form helps them plan for numbers and dietary restrictions. Please be sure to share the link to this form with anyone you invite to this event. This entry was posted in Citizen Activism, Citizen Surveillance, Events, Take Action, Volunteers on December 13, 2018 by Ellen Bouton. 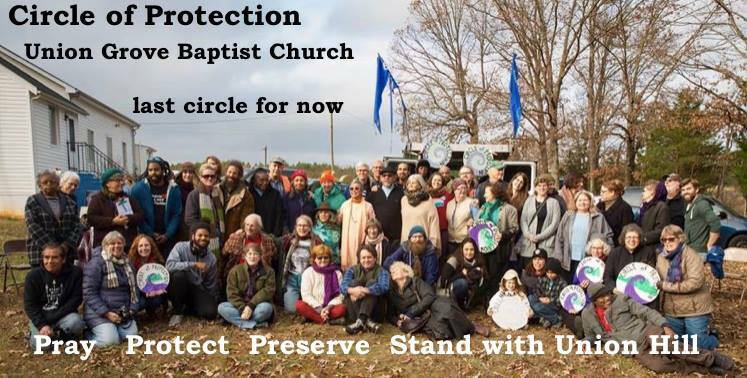 Join the Union Hill community, people of faith, water and air protectors, and artists on Sunday December 9, 2018, at 7:30 pm, for an all night interfaith vigil prior to the Air Pollution Control Board meeting which will decide the fate of the Union Hill community with a vote on the air permit for the compressor station. At the vigil, leaders from many faith traditions will share prayers, music, meditate, and more around the theme of environmental justice. Come to lift up the community of Union Hill! 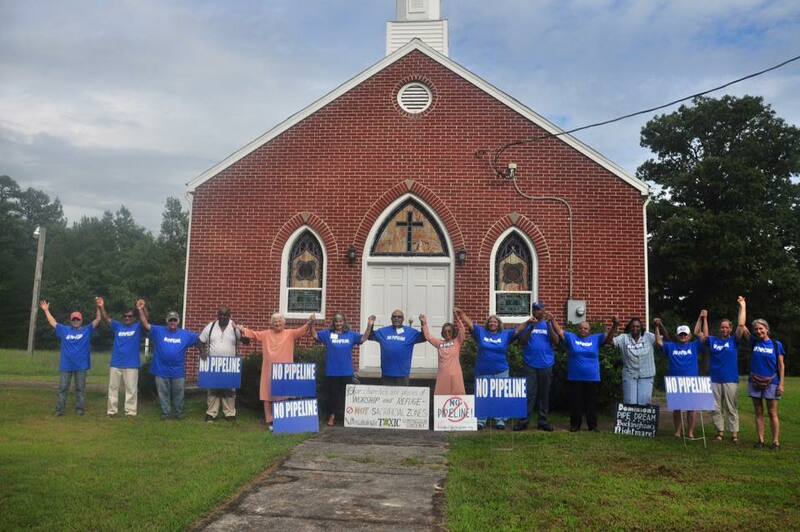 After the vigil concludes, the group will head over to the Air Pollution Control Board meeting to show up and support the residents of Union Hill and Buckingham County and to witness the decision. The Board meeting will begin at 10:00 am on Monday, December 10 in the First Floor House Committee Room, Pocahontas Building, 900 E Main St, Richmond 23219. This entry was posted in Air Quality, Certificates of Approval, Citizen Activism, Compressor Stations, Environmental Justice, Events, Songs and Stories, Take Action on December 6, 2018 by Ellen Bouton.